Allan Smith and David Smith broke Scottish high jumping records at the Scottish National Indoor Championships at Glasgow's Emirates Arena on Sunday. The pair, who are not related, each cleared 2.25m, but it was Allan who won the gold medal as he went over on his first attempt to David's second try. Their leaps were the best ever for the Championships and raise the bar for the highest jump by a Scot in Scotland. 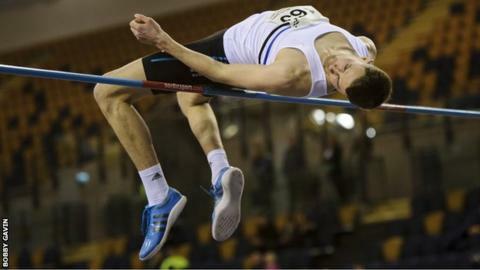 However, both men failed to make the Euro Indoor qualifying height of 2.29m. Giffnock North AAC athlete David Smith represented Scotland in the Commonwealth Games at Hampden last summer. He said: "I would have been happy if you had told me beforehand I would get 2.25 and it was a good competition with Allan and Ray Bobrownicki (third in 2.20m). "But I wanted that 2.29 Euro qualifier and I felt it was there, certainly on my last attempt. "I had a foot injury three weeks ago, though, so it is decent to be at this kind of height. "I'd love to represent GB at the Euro Indoors so I have to believe I can make that qualifying height and get there." Aberdeen athlete Zoey Clark, a Team Scotland relay runner last summer, won a 60m and 200m sprint double, setting personal bests in both. Clark dipped under 24 seconds for the 200m for the first time as she held off Beth Dobbin of Edinburgh AC in a good race to win in 23.96 seconds and earlier had beaten teenager Alisha Rees in the 60m final with a run of 7.58 seconds. "I shaved a wee bit off my PB for the 60m but it was the first time I have been under 24 for the 200m so that feels brilliant," said Clark, with that the fourth best time indoors by a Scot on the all-time list. "I had to work hard to get it because I could hear everyone pounding on the boards behind me. I am delighted. "We have done a fair bit of speed work this winter towards a better 400m time and that's clearly helped me today with the 200m." Among the other Team Scotland athletes picking up gold medals were Edinburgh AC long jumper Sarah Warnock, with an indoor personal best of 6.21m, Edinburgh AC shot putter Kirsty Yates and former footballer Grant Plenderleith in the 200m. Scotland international Cameron Tindle, 16, had to pull out of the 60m final, but it was another teenager, Alec Thomas, who won gold instead with a time of 6.98 seconds. Thomas also won a 200m silver and is now being coached by Commonwealth Games medallist Chris Baillie. Myles Edwards followed up his 1500m run for Scotland the week before with victory while it was the same story with Sam Adams in the pole vault. There was a personal best for Chukwudi Onyia in the men's triple jump at 15.40m while David Martin won the men's long jump. The men's 800m title went to Donald MacLeod, Leah Barrow won the women's gold at that distance and Fife AC's Jenny Tan won the women's 1500m gold. Warnock's win in the women's long jump came on a day when five women were over 5.75m with personal bests for Rachel Robertson and 16-year-old bronze medallist Rachel Alexander of Giffnock North. There were sprint hurdles wins for Mhairi Patience of VP-Glasgow and Jack Lawrie of Pitreavie AAC.